Our Ancestry Tests allow you to discover your origins from a genetic point of view, going all the way back to the rise of the human species in Africa. 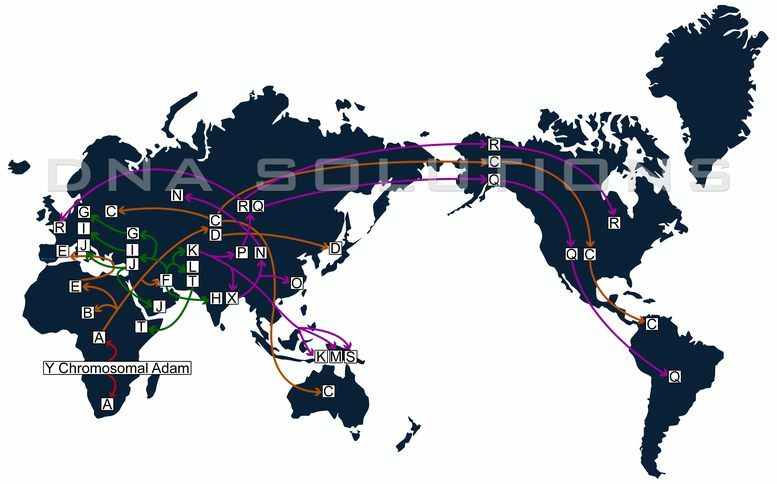 Thanks to the analysis of certain areas of your DNA, we will classify you into a haplogroup or genetic group. 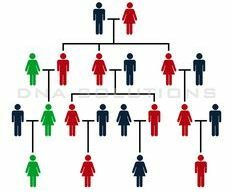 There are two ways of studying an individual's DNA origins: the analysis of the Y chromosome (Paternal Ancestry Test) and the analysis of the mitochondrial DNA (Maternal Ancestry Test). Each analysis provides different information about the origins of an individual, as each of them studies a different part of a person's DNA. You can order each test separately or order both at the same time for a reduced price. Attention! The paternal ancestry test cannot be performed on female DNA. More information below. Prices above include the shipping of the sample collection kit. Results are sent by email at no extra cost. The shipping of the results by post has an extra cost of £13. The study of your Paternal Ancestors is done through the analysis of your Y chromosome. Due to the fact that this chromosome is only present in men, women who wish to take this test will have to submit the sample of a male relative (brother, father, etc.). The Y chromosome is only present in men, and passes from father to son, generation after generation, with barely any changes. See the illustration on how this chromosome is inherited and who in the same family share that same chromosome (marked in red and in green). Therefore, all men can trace back their origins to one man that lived in Africa thousands of years ago, known as Y-Chromosomal Adam. All men are descendants of this individual. From him, all haplogroups arose as humans were evolving and populating the world. The study of your Maternal Ancestors is done through the analysis of your mitochondrial DNA. 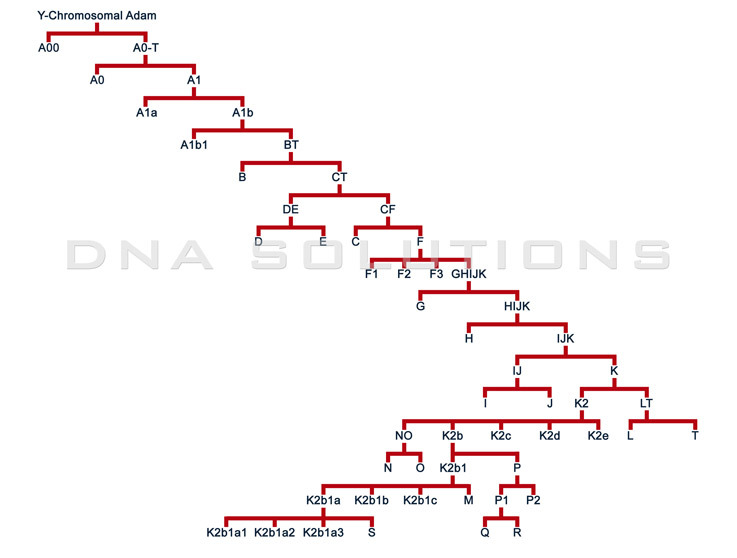 Mitochondrial DNA passes from the mother to all her descendants, to both her sons and daughters. Therefore, men have the mitochondrial DNA they inherited from their mother, although they will not pass this DNA to their descendants. Hence, much like it happens with the Y chromosome, all humans can trace back their origins to one woman, the so-called Mitochondrial Eve, who lived in Africa thousands of years ago. All humans are descendants of this woman. From her, all haplogroups arose as humans were evolving and populating the world. See the illustration on how mitochondrial DNA is inherited and which members in the same family share that same mitochondrial DNA sequence (marked in red and in green). Receive your sample collection kit and collect the samples. Easy and detailed instructions on how to collect the DNA samples are included with the paperwork. Send to us the DNA samples, paperwork and remaining payment (if any). Receive your test results in 4-12 weeks. Since the first modern humans arose in Africa, certain mutations have occurred in our DNA. Those individuals who present the same group of mutations belong to the same genetic group. These genetic groups are called haplogroups. In fact, the DNA of all modern humans can be traced back to a man and a woman in Africa, who are considered to be the most common ancestors of all modern humans. From them, Homo sapiens populated the planet. As they evolved, so did their DNA, giving birth to new haplogroups. All individuals of the same haplogroup have a common ancestor: that first human who presented that specific group of mutations which gave birth to that new haplogroup. Other times, changes in the DNA do not result in a new haplogroup, but in a subhaplogroup within said haplogroup. Thus, an evolutive tree is created from a genetic perspective. 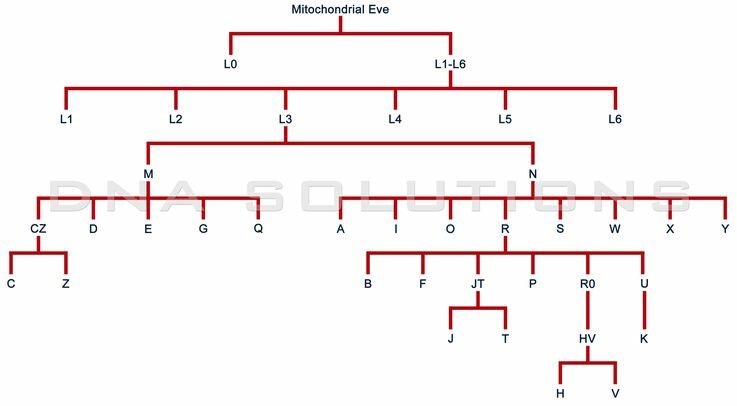 For example, mitochondrial haplogroup H has many subhaplogroups, such as H1 or H6, which are also divided in other subhaplogroups like H1a or H6b1, respectively. How is my haplogroup determined? When you send your DNA sample to us for testing, we obtain your Y Chromosome profile (23 markers) and/or your mitochondrial DNA profile (HVRI and HVRII). Then we study those profiles to see the specific characteristics of your DNA. 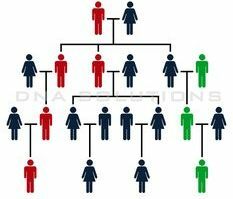 Depending on those specific characteristics on your DNA, you will be classified into a concrete haplogroup. As each test analyses different parts of your DNA, each test will tell us your haplogroups in only one those lines of study (the Y chromosome or the mitochondrial DNA). It is very important to bear in mind how those parts of DNA are inherited (see the figures above), as each test examines your DNA on just one of those lines. For example, if you want to know more about the ancestors on your paternal grandmother's side, you cannot submit your own sample because you have not inherited her mitochondrial DNA, nor any Y chromosomes from her. You can order each test separately, or you can order both tests at the same time for a reduced price (see costs below). What information can I learn from my haplogroup? Thanks to the researches done on fossils, archeological remains and on current populations, it has been possible to determine how the first modern humans migrated from Africa and populated the rest of the globe. The study of haplogroups has been key to those researches, as it reveals how certain groups of humans took some migration routes, while others took different ones. These investigations have also been able to establish the approximate date and place of origin for most haplogroups, helping to determine when the first modern humans reached different continents and areas of our planet. Hence, in their origin, haplogroups circumscribe to specific regions, although they may have expanded over other areas in later migrations. It is very important to bear in mind, though, that these analyses cannot provide any information on your origins limited to a specific country, nor can they provide any details on recent generations of your ancestors. What will I receive with my test results? You will receive a laboratory report with the results of your DNA test. This report shows the markers found on your DNA, which classify your into your haplogroup. 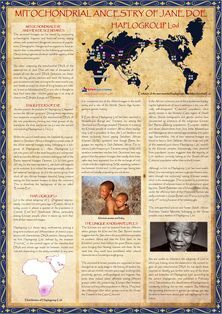 Along with the laboratory report, you will receive a document in A3 size with the history of your ancestors since the first modern humans appeared in Africa until the birth and expansion of your haplogroup. 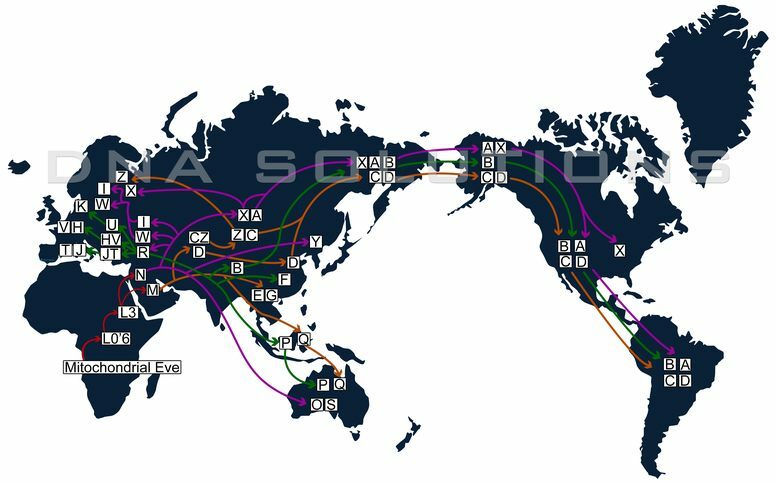 When available, we will include information such as place and date of origin of your haplogroup, tribes and cultures associated to it, current distribution of the haplogroup, famous figures who share your haplogroup, medical conditions associated to it, etc. If you have ordered both tests (paternal and maternal), you will receive two laboratory reports and two A3 documents, one for each analysis. You can also choose the style for your A3 document: traditional (left) or modern (right).